Keep in mind that there are other shops that do not always display on abprices such as Coolstuff, Miniaturemarket, RCHobbies and Alter Reality. Not that the judges should be looking at these but members who submit should research more to check into availability. You could be missing another 70-80 minis or more. Excellent and timely reminder, Robb. to review. I really don't like the idea of using all the same sculpt for a squad (unless times get desparate for minis). I found 252 between everything listed on abprices.com. Which would make for 84 squads, so if each person got three squads each we are looking at 28 people. I'm not thrilled with that. Also I would like to do everything possible to avoid a same figure common squad. So between availability and same figure common squad I'll vote to the Gatekeepers. As I said earlier, although it might have been unclear since I was posting via Kindle Fire, the sites listed above add an additional 314 minis. With the 252 that Super Bogue found on abprices, that makes 566, or 188 squads, enough for 62 'Scapers. Sweet. Maybe someone should make a common hero using that mini? Maybe even a common hero version of this card? I'll try to find darkmage's thread and make a suggestion there. The judges have rejected it because it uses one sculpt for an entire squad, instead of using multiple sculpts, and because of some theme issues. I don't think any more discussion of the mini, its availability, or the Gatekeepers needs to happen in this thread at this time. I would certainly reconsider this card as a common/uncommon hero instead of as a squad. Finally, the main changes are the cost of Kheris Fehn, raised to 120 pts and the bonus versus dragons: +2 (before, +3), to avoid a dragon killer hero too much effective. Balance: A large amount of test is already done (special thanks to our crazy playtester Laudaphnis), the results are quite positive about the cost and the playability of Kheris. You can see that the mean is a bit high, but it's normal because lots of machups were favorable to him. Reports for a majority of the tests are avalaible so if you want more details (how Kheris died, how the games went on...) you can pm me. Note: Those tests were done more in a casual game point of view rather than in a tournament game point of view. Our priority was to make Kheris fun to play. Playability: We worked a lot on this part. The special attack Slayer jump didn’t give us any problems because similar powers already exists. Tthe power Deflection gave us lots of troubles in order to make it clear, simple, effective and without any problem in the game (infinite turn, interaction with others powers…). I think we achieved this objective. 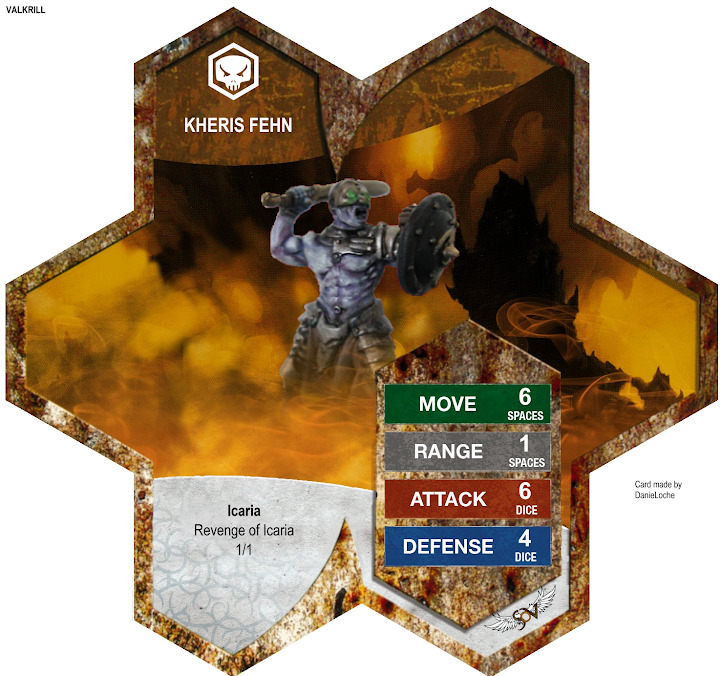 Kheris uses a single-hex base like the others confrontation figures. His special attack Slayer jump give him extra movement, allowing him to dash on his preys, even if it is on moderate height. While trusting forward or engaged, his shield can withstand even the fiercest attacks. His life-long battle against Dragons enable him to predict their attacks and defend himslef even better against those foes. Kheris can also use his shield to cover his back when leaving engagment. So good is his shield dexterity that Kheris can even deflect parried strike (parried by normal defense or by the Nnah Scirh Shield power) back to the attacker. On the other hand, should his shield not protect him against an attack, Kheris is quite frail for a Hero, with only a defense of 3. His 5 lifes give him nonetheless some staying power but will not last long under sustained attack. Moreover, his ability to deflect back attacks only work against basic attack, ennemies can safely attack him with special attacks. 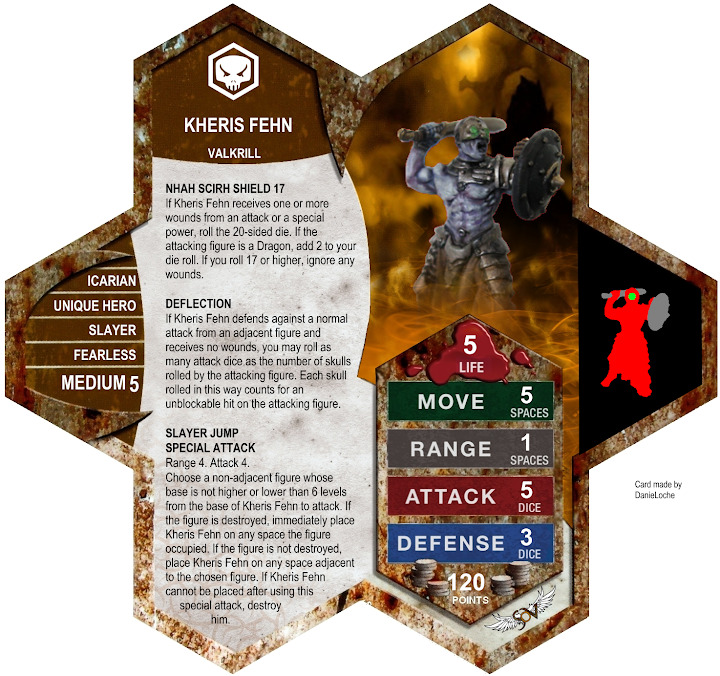 Kheris is a shark, with a long range of attack, and a set of defensive powers that can make the opponent ponder how to deal with him. Jotun can surely kill him quick, but who want to rolls 6 skulls out of 8 and see Kheris deflect it back with a lucky d20 roll ? Creativity: Our goal was not to create a revolutionary figure, we just wanted to create a good hero with some orgininal (but not revolutionaries) powers. We wanted to give him a counter-strike power, but not the classic counter-strike which is already very used. Our idea was that stronger is the attack from the opponent, stronger should the deflection be. But it is risky, because against stronger attacks, Kheris must rely sollely on his Shield power to protect itself and trigger the deflection. Smaller attacks are easier to deflect, and it is reflected by the fact that both the Shield power and the basic defense roll can trigger it. The two others powers of Kheris are not something new to Heroscape. The Nhah Scirh Shield power is inspired from the Stealth Armor of the Microcorp agents, with a bonus against Dragon to reflect the roots of Kheris. The Slayer jump special attack is an adaptation for a Hero of the "Pounce" special attack of the Wolves of Baldru. Kheris is obviously a hero-killer (a shark), his slayer jump allows him to aim aura figures or long ranged heroes quite fast. His Nnah Scirh Shield gives him more resistance from shoots during is charge and it increases the deflection chances (because Nnah Scirh Shield and Deflection can be used together!) His Deflection makes him stronger in a face-to-face with big heroes and allows him to be more resistant against squads. But he has only 3 defense without range or defensive power so he's quite fragile. Obviously his main weakness is ranged squads, you must not send Kheris to the front if there is still lots of ranged units. On the side note, Kheris has a little bonus against figurine with power that grant them automatic shields when rolling defense, because those powers are negated during the Deflection. Finally Kheris is kind of Eltahale but not as polyvalent as her (Eltahale is also strong against squads), in consequence he costs less. He’s another option for a hero-killer in this cost, for example if we compare him to Sgt. Drake V1, they’re 2 good hero-killers but they have different strenght and weakness. Kheris will certainly not become the figure of the year but it’s another good hero option in the draft. Theme: Confrontation figures proved to fits very well with Heroscape. At the beginning we wanted Kheris to became the second figure from planet Isadora. But when Dalu and Seb from Space tolds us about a Nnah Scirh squad from Icaria at the C3V, we completely changed the background of Kheris and decided that he will be a Nnah Scirh assassin. For more coherence in the background we added a bonus against dragons (little bonus which works well: check the stats). No bonding with the Nnah Scirh squad because we don’t know anything about this squad and because Kheris looks more like a lonely assassin than like a leader in ours opinions. Availability: We are not specialists of U.S figures sellers but as he's quite common we guess he's also common in America. .His species is now Icarian in order to fit with the C3V squad. .Complete rewording of the power Deflection. .Little rewording of the power Nnah Scirh Field and bonus +2 (before, +3) against dragons. .Cost raised to 120 pts. Last edited by DanieLoche; November 22nd, 2014 at 01:28 PM. Reason: Wrong card with attack 6. Add a "special" before the two "power"s, and the wording looks correct. However, I only found 10-15 of the mini (I only looked at a few sites, though). I think it's okay to leave it on there just to clarify. Ah, that's a place I didn't look. In that case, availability shouldn't be a problem. As for that line, I'm not fond of it, but it might be necessary. It's great to see Kheris in his new form. I applaud the French community for your persistence and attention to quality. Seeing him again, my initial impression is that he is rather complicated. Lots of powers with lots of conditions and details, some of which interact with each other. I'm a believer in "simpler is better". But I recognize the detail is there for theme, and I don't have any issues with any of the powers. And he does look interesting to play. I vote to review Kheris Fhen.